Welcome to another installment of LiveAnalysis! Today we have the first Wimbledon final to be contested by the gentlemen born a week apart from each other in May of 1987: World No. 1 Novak Djokovic and World No. 2 Andy Murray. Here’s how Novak Djokovic made it this far, and here’s Andy Murray’s path to the semis. Here’s the H2H between these two (which Novak Djokovic leads 11-7). Here’s the number of times Djokovic and Murray have played each other per year: 2006: 1. 2007: 2. 2008: 3. 2009: 1. 2010: 0. 2011: 3. 2012: 8 (!!!). 2013: 2 (counting this match. Both meetings this year have been Slam finals, too). Hence, including tomorrow, 13 out of their 19 matches (68%) have been played in the past 3 years. The Mirror Image Rivalry, as I call it, is truly starting to take over the ATP World Tour: they’ve met in 3 out of the last 4 major finals. 1. Who will be able to dominate on serve? These two men are the best returners of serve on planet Earth, and to make matters worse for their opponents, they’ve both been serving pretty well during the fortnight. In Shanghai last year they both unleashed a return of serve blitzkrieg on one another. At this year’s Australian Open, they couldn’t find a way to break each other after 2 sets. 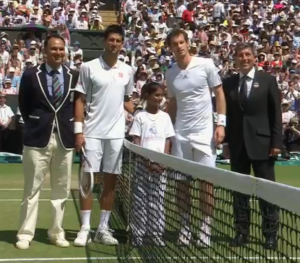 It’ll be interesting to see where the trenches are dug in this match: on Murray’s service games, or on Djokovic’s? Who knows. What I am sure of is that whoever has to work harder to hold serve and constantly has to face pressure when serving will have a tough time finding a way to come up with the winner’s trophy at the end. 2. Can Novak Djokovic find some confidence in his backhand down the line? That shot is crucial for the Serb’s chances, since Murray adores engaging in AD-court rallies, leaving the Deuce court wide open for a good backhand down the line from Djokovic that will inevitably lead to a Murray running forehand. However, Djokovic has been struggling with what he calls his “favorite shot” this year, for reasons that are completely unknown to most people (I assume he and his team have a few ideas of what’s causing the problems). Against Juan Martín del Potro, Djokovic had to work twice as hard to gain an edge during rallies, since that two-hander was misfiring badly when ordered to send the ball down the line. The same will be true against his long-time rival today. 3. Will Andy Murray be able to step up to the baseline and dictate play for most of the final? I’ve been thoroughly unimpressed with Murray’s attitude during baseline rallies in his past few matches (but very impressed with his first serve): he’s gone back to being passive and merely reacting to what is being thrown at him. That’s just not going to work tomorrow: he needs to come forward, he needs to hit deep, heavy forehands, and he needs to be proactive with his own backhand down the line. I’m not advocating for Andy to close his eyes and blast away. I’m advocating for controlled, patient and steady aggression. That’s the only way to defeat a great defender like Djokovic who doesn’t mind standing on the baseline and dictating points. Such an approach involves patience and great execution on shots designed to produce short balls (the cross-court forehand is a must, as is that aforementioned but rarely used backhand down the line. Also, moving up after good returns). I didn’t see any of this in the last two Murray matches, so I’m quite intrigued as to what the Scot’s approach will be tomorrow. It's been 77 years since a British male won Wimbledon. A Brit woman last won in '77. Will Murray get lucky on 7/7? Or Slam No. 7 for Djoker? 0-0: A fun, interesting rally gets us started. Djokovic was the one forcing the issue with a couple of down the line shots (both FH and BH), but misses wide on a FH DTL to end it. Great omen. A great return by Murray makes it 0-30. Another FH DTL mistake by Djokovic, and it’s 0-40. Flawless start from Dunblane’s finest. A SW out wide saves one BP for Novak, but it’s still 15-40. Murray seems to have a handle on a smash that was heading straight to him, but slices it into the net. 30-40. A simply gorgeous CC angled FH by Djokovic forces the error from Murray, and it’s Deuce #1. 3 BPs saved by Djokovic. Return mistake by Murray, and the World No. 1 has a chance to hold. BH DTL UFE by Murray, and Djokovic has held. Tactical Update: Djokovic has come out of the gates trying to pull Murray wide on both sides of the court, either via DTL shots, or sharp-angled CC shots. Murray tried to be aggressive with the return, but not during rallies. Still reacting. 1-0, Djokovic: Murray tried to be aggressive with an I-I FH (a shot he hits with ease), but Djokovic anticipates it and his running CC FH forces an error. However, Murray hits his 2nd ace of the game, and he’s held. 1-1: Djokovic is clearly trying to make Murray think twice about where that FH is going – he’s mixing up the DTL variation way more often than usual. However, a 2nd dropper of the match goes awry, as does a BH DTL. So he’s at 30-all. Murray gets a wonderful CC FH in, and it’s 30-40. BP #4 for Murray, and it’s just Djokovic’s 2nd service game. Then…what a point. The men engage in a furious Deuce court rally, but cover every bit of the baseline during it. It ends when Djokovic hits a beautiful CC angled FH that Murray can’t return. Moments later, a costly mistake by Murray, who tracked down a bad volley from Djokovic, but framed the putaway FH. Could’ve been another BP. Djokovic botches a BH DTL, and it’s Deuce #2. Then, another Deuce-court rally ends when Djokovic goes for a FH DTL…and misses. BP #5 for Murray. It’s saved by a fantastic SW out wide. An extremely cheap 2nd ball FH UFE by Djokovic makes it BP #6 for Andy. This is getting ridiculous. And the BP is saved via a good BH DTL by Djokovic that Murray can’t put back over the net. Another poor volley by Djokovic is correctly tracked back by Murray, and it’s BP #7 for the Scot. 2nd serve. And the 7th is the charm! Andy Murray with a gorgeous point: he went for a sharp angled FH CC, then followed it up with a BH DTL putaway, since Djokovic was in full scramble mode and had decided to cover the AD court. Brilliant. Andy Murray is up a break! "And as evening falls into night, both players being treated for severe dehydration here at the All England Club. It's 1-1 in the 1st set." Tactical Update: More in more you could see in that last game that Murray is very determined to not only hold his own on forehand-to-forehand exchanges, but he’s trying to do some damage in those exchanges via pace and angle. A very good idea. 2-1, Murray: Novak comes out firing with his FH, way more aggressively than he’s hit that shot up until this point, and he is quickly up 0-40. Three chances to get back on serve. The Serb plays a wonderful point…but barely misses on a FH DTL. Great defending from Murray, and it’s 15-40. Murray decided to be aggressive with his CC BH, and it seemed like a good idea, but Djokovic found a way to run around his two-hander and fire away with his I-O FH, and he forces the error to break back! It has to be disheartening for Murray to work so hard for a break of serve, and then see it go away after just a few minutes. 2-2: Djokovic seems set for a quick love hold as he has a most straightforward putaway volley at 40-0…but nets it. Somehow. Then Murray hits a wonderful FH CC winner, but the World No. 1 ends up holding anyway after a short FH by Murray clips the net and lands in the doubles alley. The break has been consolidated. Stats Update: In just two games, a problematic stat for Andy Murray: just 1 of 5 points won on his 2nd serve. 3-2, Djokovic: A wonderful response by Murray, who fires a BH DTL winner, followed by a FH I-I winner to hold to love. A first in this match. 3-3: Novak Djokovic doesn’t put away an overhead smash, and it ends up costing him. Later, a FH DTL UFE, and it’s 0-30. Then, a short CC BH putaway goes out…it’s challenged, but it was an inch long. Andy Murray is up 0-40. A deep return by Murray can’t be handled by Djokovic’s BH DTL, and Andy Murray is up a break again! Simply a horrorshow game from the World No. 1. He played a beautiful first point, only to see it go to waste when a regulation smash wasn’t put away into the open court. 3 straight UFEs followed, and he’s back in a break hole. 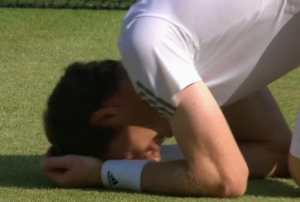 4-3, Murray: Andy Murray once again digs himself a 15-40 hole, via 2 DFs and a good Djokovic BH DTL. An Ace saves the first BP, but it’s still 30-40. A bit of drama at 30-40: Djokovic hits a FH that Hawk-Eye shows to be long, Murray hesitates, no out-call comes, he keeps playing the point, Djokovic ends up making a mistake and complaining to Lahyani that Murray had stopped. Not really, though. Moments later, another UFE from Djokovic, and Murray has a chance to hold. Moments later, Djokovic stays aggressive, and finally puts away a smash correctly. Deuce #2. It’s BP for Djokovic after he forces the error on Murray’s BH. Fantastic stuff from Murray, who has a look at a mid-court FH, and goes I-O with it. He follows it up into the net, and puts away a simple smash. Deuce #3. FH UFE by Djokovic, and it’s GP for Murray. Another fantastic CC FH by Murray, and he’s finally consolidated a break. Tactical Update: Murray is using his CC FH extremely well. He’s being aggressive with it, always trying to do some damage. It’s paid off, big time. Stats Update: Winner/UFE numbers for both gentlemen – Andy Murray: 15/6. Novak Djokovic: 4/15. 5-3, Murray: Djokovic found himself at 0-30, but dug himself out of it, and can hold at 40-30 after a SW 2nd serve. Then, Djokovic slips in a very strange way. He was sliding smoothly, and all of a sudden, he stopped. Lost the point, so it’s Deuce #1. Moments later, the World No. 1 has held. As badly as Djokovic has played, it’s amazing that he’s only down one break (and had 3 BPs to get that break back, too). The inevitable pre-match tension has given way to the frustrated wtfs at the scrappy nature of this match. 5-4, Murray: An Ace up the T makes it 30-0. Smart slider out wide, and it’s 40-0. SW, and the set is finally headed Andy Murray’s way. First Set to Andy Murray, 6-4. 0-0: Novak Djokovic avoids having to fend off break points, and holds to 15 without much fuss. Not much has changed. That last tweet has been the best part of this match so far. Sigh. 1-0, Djokovic: Djokovic unloads his frustration at his own mediocrity with a blistering CC FH return winner. But it’s 40-30. Then, what seemed like an ill-advised slice+net approach combo ended up working, thanks to how deep the BH slice was. Deuce #1. SW out wide, Djokovic challenges, but there’s not much faith behind the request. It was in. GP, Murray. FH UFE by Djokovic, and Murray holds. There’s no way to hide it: this match is hideous. Not enjoyable at all, no matter your player allegiance. Too nervy, too many mistakes. Just a mess. Is tv mentioning Djokovic's wrist? Allegedly a concern in the camp. Assuming that was from stumble he took in set one? 1-1: Djokovic flirted with disaster in that game, but ended up holding to 30. Not much more has changed. 2-1, Djokovic: An extremely long point ends with a Murray UFE, and just moments later, another UFE gives Djokovic the break. Tactical Update: The initial thoughts by either man at the beginning of this match have faded. All we have right now is a grindfest. Just two nervous guys trying to survive each other. 3-1, Djokovic: Novak again flirts with danger, but ends up consolidating the break. 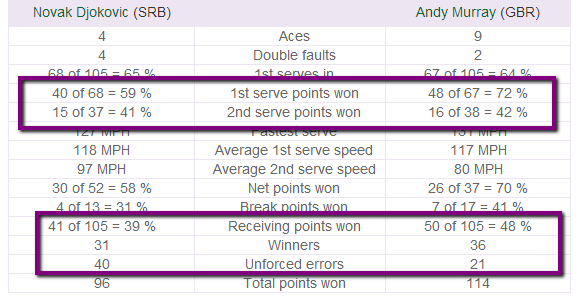 Stats Update: The winner/UFE ratio for both men is suspiciously low so far (4/4 for Djokovic, 3/3 for Murray). But the story again is that Andy Murray has won only 1 out of 5 points played on his 1st serve. And has won only 29% of all return points. He was near 50% in the first set. 4-1, Djokovic: Murray repays the favor, holds to 15. Not much to tell from that game. 4-2, Djokovic: Andy goes on the offensive with his CC FH, which has been quite a succesful scheme so far, and he’s up 30-0. SW, 15-30. Then, bad fortune for the Serb: he comes to net to put away a simple-looking volley, but Murray’s pass clips the net at the very last second, messing with his timing. 15-40, then. Djokovic smartly opens up the court with an unexpected I-O BH, and Murray can’t get the reply over the net. 30-40. Djokovic remembers his 1st set DTL ideas…but Murray comes up with a pretty soft BH UFE. Deuce #1. SW, GP for Djokovic. Gorgeous CC BH return winner by Murray off a pretty bad Djokovic 2nd serve. Deuce #2. Then, more great stuff from Murray: a blistering CC FH sends Djokovic to the ground. He hit it on the run, too. That shot could be the difference between these two. BP for Murray…and the break is handed over to him via a Djokovic DF. Tactical Update: Andy Murray has snapped out of his mid-match stupor, remembered how key that CC FH is, and reaped the rewards. As for Djokovic…he was unlucky at first, but dug his own grave with that DF on BP. Murray hitting great CC FHs is like a dodgy NBA shooter hitting 3s. In the end, it’s the shot you want them to have to make in order to beat you. The problem comes if they stop missing altogether. When you see Andy Murray crush the little yellow pill as he did on those two consecutive points, you wonder why he doesn't do so more often. Neither have really impressed for more than a couple of points at a time. 4-3, Murray: The Scot gets sloppy at 30-0, and after a few moments, Djokovic puts away a smash for a 30-40 BP chance. Murray saves it via an Ace – and there goes the last of Djokovic’s challenges in this set. Nice slider out wide, and it’s GP for Murray. Djokovic wins a Deuce-court FH exchange (for the first time in what seems like ages), and it’s Deuce #2. Djokovic then plays a masterful point, in which he completely outmaneuvers his 1987 colleague, and finishes by forcing Murray’s error with a FH DTL. Superb. BP for Djokovic. Murray gets lucky once again, as a big FH (which Djokovic had anticipated), clips the net and throws Djokovic’s timing off. Moments later, he smashes away the BP. Deuce #3. A good serve leaves Murray with a short ball, and he puts it away with a nice dropper. GP, Murray. The local hero holds after a wonderfully placed serve up the T.
Murray holds, a death march game in a death march match. 4-4. Enormous game coming up for Djokovic. 4-4: Djokovic dives into the ground for a volley, and is rewarded for the effort. 40-0. Then, a short ball is put away with a BH DTL. Perfect game from Djokovic – the first of such kind in a long, long time. 5-4, Djokovic: Murray can’t survive a FH exchange, and it’s 0-15. Djokovic then gets a look at a BH pass…but nets it. That was an opportunity missed, given the time he had to hit that pass. Ace up the T, 30-15. Djokovic forces the issue with an I-O FH, draws an error. 30-all. Murray with that great slider out wide, and it works yet again. 40-30, and an atrocious 2nd serve return error from Djokovic seals the game. Tactical Update: Murray has been mixing up his 1st serves beautifully. Djokovic has no clue when that slider out wide from the Deuce court is coming, basically because of Murray’s ability to go up the T with it. You can’t survive on tour with just one good serve. You need two to keep people guessing. 5-5: Djokovic thought a Murray BH was long, there was no call, and he’s out of challenges so no dice. Now he complains to Mo. Why the anger? It’s 15-30 after he makes an UFE later in the point. At least Djokovic was wrong: the ball clipped the line. Then, a mental mistake from Djokovic, as he runs around his BH at the worst possible time, and Andy Murray has 2 BPs. A thunderous serve is followed by a rarely emphatic smash by Djokovic. Lots of frustration in that shot. 30-40, still. Then, disaster for Djokovic: a 2nd ball FH UFE from a comfortable position gives Andy Murray the break! Disastrous form from Djokovic. Simply disastrous. His mind, which is one of his core strengths, is in complete disarray. Andy Murray with a golden chance to get a 2 sets to 0 lead. On most of the big points, #AndyMurray serves slice to #NovakDjokovic's forehand. 6-5, Murray: A SW out wide, and it’s 30-0. Then, a horrid BH UFE 2nd serve return by Djokovic gives Murray Triple Set Point. An ace out wide seals it. Javier Frana has spoken the truth: whenever Andy Murray has needed good serves in key moments of this tournament (particularly to put sets and matches away), he’s been absolutely clutch. Kudos, Muzzard. Second Set to Andy Murray, 7-5. So given that London Olympics SF 2012 was the only time these two have met before on grass, Murray is 4-0 in sets on this surface. 0-0: Djokovic keeps being sloppy, and is down 0-30 to start. A short serve nets a short FH, and it’s put away. 15-30. But a bad drop shot (particularly because of the complete lack of disguise on it) by Djokovic gives Andy Murray 2 BPs. Confusion takes over CC, as Djokovic’s slice is called good, Murray challenges, and is proved correct. Andy Murray is up 2 sets and a break! 1-0, Murray: 2 horrid BH CC UFEs by Djokovic, and Andy Murray has three chances to consolidate his break. 2-0, Murray: Djokovic falls behind 0-30 in about 2 seconds. Then, a Murray pass doesn’t clear the net by much, and it’s 15-30. A good serve sets up a short BH, and it’s 30-all. A good CC FH, and Djokovic has GP. Another good serve sets up an easy swinging volley, and Djokovic has survived. 2-1, Murray: Muzz is in a 0-30 hole, but digs himself out via a couple of bombs. 30-all. However, a bad Murray counter-drop allows Djokovic to put away a BH and have BP. Then…a calamitous botched volley from Murray goes wide…and Djokovic is back on serve. 2-2: Djokovic back to his DTL ways, and after one misses, the next connects. Up 30-15. Also, the drop-shotting ways are back: 2 have worked so far, but the latter only succeeded because Murray biffed the counter. Soon after, Djokovic holds. @juanjo_sports One of the great things about tennis–score isn't cumulative so can't coast in garbage time. Always have to close. 3-2, Djokovic: Horrorshow game from Murray, and it’s now 15-40. Another FH UFE by the Muzz, and Djokovic is up a break. Centre Court is flatlining. 4-2, Djokovic: Murray goes up 0-30 behind purposeful play, but Djokovic gets a point back via a well placed BH pass. 15-30. Murray then comes to net, and puts away a masterful CC BH. 15-40 for Murray. Djokovic leaves a FH CC hanging, and Murray takes advantage. The Muzzard is back on serve. 4-3, Djokovic: Muzz sandwhiches good play between two pretty bad FH UFEs. 30-all. FH DTL UFE by Djokovic, and Murray has a chance to hold. Djokovic tries yet another dropper, Murray tracks it down, and he’s two games away from the Wimbledon title. 4-4: Another poor drop shot from Djokovic, and not even a lob can save him. 15-30. Incredible scrambling by Murray is rewarded by a terrible volley from Djokovic, and the Muzz has 2 chances to break. Then, a tame 2nd ball FH UFE by Djokovic seals the break. Andy Murray will serve for the Wimbledon title! As Javier Frana said, Andy Murray has been extremely solid when putting away sets and matches with his serve during the fortnight. Biggest service game of his life coming up. 5-4, Murray: BH DTL UFE by Djokovic, 15-0. 2nd serve. Another bad dropper, and it’s 30-0. SW up the T, and it’s Triple Championship Point. Djokovic saves the first one via multiple volleys. 40-15 anyway. 2nd serve. Blistering I-I BH winner. The serve was simply atrocious. 40-30. 2nd serve. BH DTL UFE by Murray, and it’s Deuce. Horrible FH UFE by Murray, and now Djokovic has BP. SW up the T saves the BP. Deuce #2. Then…extreme good fortune for Djokovic, as his half-volley clips the net and simply dies on the other side of the court. Insane. BP for Djokovic again. 2nd serve. A very tense rally ensues…and Murray barely clips the baseline with a BH DTL. No out-call, and soon after, Murray doesn’t miss a short FH putaway. Deuce #3. Then, a bad dropper by Murray is put away by Djokovic, and it’s BP again. This game will kill Britan. But Andy Murray comes to his own rescue, with a forceful I-O FH, and a simple volley. Classy play. Deuce #4. Then, a classic Djokovic failed smash leads to Murray chasing down a bad volley and putting it away. Fourth Championship Point for the Muzzard. It ends, fittingly, when Djokovic sends a BH DTL into the net. Andy Murray is your new Wimbledon Champion! Game, Set, and Championship to Andy Murray, 6-4, 7-5, 6-4. Andy Murray won Wimbledon. He really did. And he did it behind an awesome 1st serve, effective defending, and opportunistic aggression. So, he did it on his own terms, really. Which I find remarkable, since everyone (me included) thought that winning Wimbledon would require a switch of sorts into a more aggressive template. The Scot was the steadier of the two finalists from the baseline, but he really dominated with his first delivery. 72% of 1st serve points against the man who is widely regarded as the best returner of serve on the planet is pretty impressive. 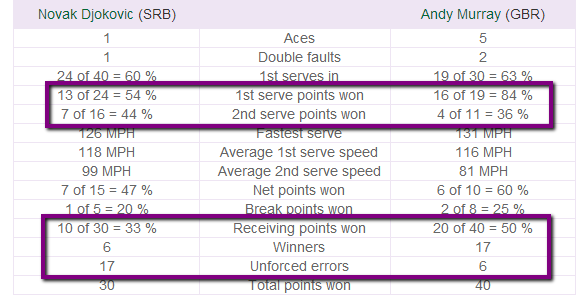 And as you can see above, Andy put in question that very statement (about who the best returner of serve is), as he won the returning battle by a wide margin. In the end, probably the surest path of success is sticking to your guns and hoping for the best, no? That’s exactly what Andy Murray did (and many greats before him, it has to be said). 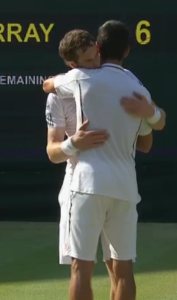 Great players force the game to be played on their terms, and this is exactly what Judy Murray’s son did today. Now, let’s talk about the World No. 1. I’ve been thinking about his performance all day, and I have to conclude that this was by far the worst Slam final he’s ever played. It’s a testament to how absurdly lenient the Wimbledon stats people have been during the fortnight that Novak Djokovic ended with “just” 40 unforced errors. I’m confident that I could go back and watch the match again (don’t worry, I won’t do such a masochistic thing) and find his “real” tally to be at least in the 60s. The saddest part of Djokovic’s performance is that the top ranked member of the ATP just didn’t have an anchor in his game. Every single aspect of his tennis was prone to let him down at any given moment. Even the most historically trustworthy parts, like his two-handed backhand. And you just can’t win a Grand Slam when you don’t know what parts of your game you can count on. Still, as badly as Djokovic played this final, he was up a break in sets 2 and 3. And he scared the life out of Andy Murray and the whole of Great Britain in that last game of the match. So there’s that. In the end, it’s unfortunate that these two great players produced such a horrific final. It just might be that having such a similar skillset and being so familiar with each other (they’ve been battling on a tennis court since age 11, apparently) will inevitably conspire with the obvious enormity of the occasion. Just like it happens when siblings play each other. But just like it happened in the women’s final, the best scenes of the day were saved for what happened after a young man finally realized his lifelong dream. And what has to feel better is that in the end, he did it his way. I think Djoko’s dtl will work better vs Murray than vs Del Potro. It’s a very sensitive shot and I think Del Potro deserves the credit for not making it easy. The big moments will be key I think-like the tiebreakers and both players-esp Djokovic will be more suceptible in the late match to being broken. Early tiebreakers should favor Djokovic cuz he’ll be the agressor in control and still very fresh. Mainly due to lapses in concentration-Djokovic always gives an opportunity in the late match but just as soon as it appears it also disappears and Djoko seems to be back to his normal self. Murray will have to grab those moments. One of the worst slam finals at Wimbledon any men’s tennis fan has had to endure. Don’t want to see tennis after Rafa and Roger. Rafa and Fed had their stinkers too…don’t judge it on this one match. I guess your standards are higher than mine, Juan José, because while I’d never argue that the men’s final was a great match, I found it well short of horrific. Yes, it had more errors than it should have, and yes, there was a shortage of sustained fabulous shotmaking (by both players). But I think it a mistake to not give Murray credit for taking Djokovic out of his game. In that regard he reminded me of Agassi (! ), who exhibited outrageous discipline in continually refusing to move in behind short balls, preferring to pound yet one more ball into the open corner (over and over and over again). Certainly Murray didn’t do that, but he did frequently resist the temptation to go toe-to-toe with Nole, and for that I think he deserves an adjective more complimentary than “horrific”. It takes two to make a match (of any sort), of course, and in this I was surprised by Djokovic’s play just as you were. How he allowed Murray to have an average 2nd serve speed of 80 mph is hard to fathom. He cracked a few returns and, while he blew a few he took on the rise I was shocked that it never became a theme of his return games. Hindsight is 20/20, or easier said than done? I can’t say, but it was surprising to see. In the end it might just be that Murray was, surprise!, the one who handled the history of the situation better than Djokovic.